Hello from the Old Dominion! The following is a list of updates from various institutions around the state concerning everything from new projects, acquisitions, and staff to recent and upcoming exhibits. I am pleased to report that in December 2014, Chris Barbuschak joined the staff of the Virginia Room, City of Fairfax Regional Library, Fairfax County (VA) Public Library. With an MLIS, he brings significant library reference experience as well as manuscript and photographic archives credentials. Projects that have languished on the “To Do” list are being tackled! It is great to have Chris on staff. In 2014 W&M welcomed Kim Sims as its new university archivist. As university archivist, Sims will be responsible for documenting the history of the university, assisting in the development of strategies to manage and preserve digital materials, and creating policies for management of electronic theses and dissertations. She comes to W&M from Duke University where she served as a technical services archivist for the Rubenstein Rare Book and Manuscript Library. Sims earned a master’s degree in public history from North Carolina State University and a bachelor’s in history from the University of North Carolina at Wilmington. The Fairfax Circuit Court Historic Records Center welcomed a new employee, Heather Bollinger who as a MLIS and a MA in History. She brings great enthusiasm and experience in the technical aspects of running an archive. We have started a new blog “Found in the Archives” that highlights unique documents that are part of our collection http://www.fairfaxcounty.gov/courts/circuit/found-in-the-archives.htm. We have also started Friday tours of the Historic Fairfax Courthouse and our facility. The George C. Marshall Foundation Research Library and Archives recently launched an online exhibit titled “Over There and Back: The Diary of Homer E. Simpson as Kept During the Great War” on the Google Cultural Institute. The exhibit features the diary of Private Simpson, a native of Covington, Virginia, and chronicles his wartime experiences from reporting for duty on May 22, 1918, through his discharge on June 26, 1919. Particularly poignant are the passages that Simpson wrote about being in the trenches when the armistice went into effect on November 11, 1918 at 11:00 AM. Other documents and artifacts, including Private Simpson’s helmet, gas mask, and medals also appear in the exhibit. The exhibit “Over There and Back” joins two other exhibits about the Marshall Plan and D-Day that the foundation’s research library and archives developed for the Google Cultural Institute. George Mason University Libraries Special Collections & Archives has reached agreement on two important bequests in 2014. In the first of these, benefactor David Stone announced his intention to bequeath his massive collection on Gilbert and Sullivan to the University Libraries’ Special Collection & Archives. In a Mason News story by Corey Jenkins Schaut, the collection is described as “a treasure trove of Gilbert and Sullivan memorabilia, from original manuscripts to production materials to letters and personal effects of the two men and their partner, Richard D’Oyly Carte.” The collection complements existing strengths in performing arts collections such as the Arena Stage Archives and Federal Theatre Project Collections. The second bequest is the Hayden B. Peake Intelligence Collection, which consists of approximately 10,000 books and one authenticated George Washington letter. Well-reputed in his field for his library, exhaustive reading, and expert book reviews, Mr. Peake has spent a lifetime assembling this comprehensive collection that represents the output of (mostly) English-language nonfiction books about intelligence from the first books published on the topic in the seventeenth century to the present. Besides collecting inclusively, Mr. Peake has sought out specimen that are in the best, most complete condition to be found, and that feature original dust jackets (already preserved in plastic sleeves), author signatures, and marks of provenance such as bookplates and notations from important former owners who include Winston Churchill. This collection will be important for research across many Mason schools and programs such as Intelligence Analysis and Technology, History, Political Science, and Conflict Analysis and Resolution. The University Libraries has already received the George Washington signed letter — written by an identifiable member of Washington’s staff, to the officer commanding the militia in the County of Monmouth, Springfield, NJ, June 14, 1780, and authenticated by the Washington papers project staff at UVA. In January, The Wyndham Robertson Library at Hollins University officially celebrates the first year of the Hollins Digital Commons (HDC). The HDC is an online repository of scholarship, creative works, and historical record of Hollins University. Special Collections material includes a Gallery of Presidents, articles on Hollins history, images from scrapbooks, and medieval manuscript leaves. The Kaine Email Project @ LVA launched in January 2014, which made accessible the email records from the administration of Governor Timothy M. Kaine, Virginia’s 70th governor. Legislative Petitions Digital Collection was completed in June 2014. The Chancery Records Index surpassed 9 million historic court record images freely available online. In 2014, a partnership between the Norfolk Southern Historical Collection, the Virginia Museum of Transportation, and the Historical Society of Western Virginia (along with grant funding from the Virginia Foundation for the Humanities) helped to document the stories of African American railroad workers in an exhibit and a book. African American Railroad Workers of Roanoke (2014) is the product of an oral history project undertaken by Roanoke’s African American Norfolk and Western Heritage Group. The group was founded in 1996 with fifteen members retired before 1970, with a combined 170 years of service with the railroad. Photographs and archival materials, along with oral histories, help to tell their stories, and along with it the story of the railroad. Twenty interviews yielded more than 1,000 pages of transcripts. The interview transcripts are housed in all three participating repositories. Images and items from the Norfolk Southern collection were also used in related exhibit at the Virginia Museum of Transportation. The community at FrancisEmma.org lives in the former schools – St. Francis de Sales School (for Black girls) and St. Emma Industrial and Agricultural Institute (for Black boys) in Powhatan, VA. It was later renamed St. Emma Military Academy and is also called “Belmead on the James.” The Sisters and volunteers are restoring the buildings. St. Emma’s was the home of Philip St. George Cocke, an officer of the Confederacy who died in 1861. Colonel Edward Morrell (Pennsylvania National Guard) and his wife Louise Drexel Morrell bought the property and open St. Emma’s in 1895. Mother Katharine Drexel, foundress of the Sisters of the Blessed Sacrament, built St. Francis de Sales High School on land adjacent to St. Emma’s. Louise Drexel Morrell was Mother Katharine’s sister. St. Francis opened in 1899. Cocke’s Mansion now houses offices of the Sisters and a small museum and archives of the two schools. The archives of the two schools are housed primarily in the Archives of the Sisters of the Blessed Sacrament (Bensalem, PA) but many original materials, artifacts and photographs are in the Powhatan schools’ museum. Both schools closed in the early 1970s. There is an active alumni/alumnae group assisting in the restorations. Special Collections and Archives at both libraries have been very busy. VCU Libraries is adding a new addition to the Cabell Library, so much of our time and energy has been devoted to this project. Both SC&A departments have worked together to get collections moved to their new home. It is so nice to have shiny new compact shelving that holds record center boxes! There is still much more to do, but we are excited about the changes. The new construction is scheduled to be completed by the end of 2015. The launch of VCU Libraries Gallery, an Omeka site to showcase items from our collections and host digital exhibits. The Freedom Now Project, part exhibit, part crowdsourcing project, it displays images documenting the Farmville, VA civil rights protests in 1963. The public is invited to share their recollections and to help identify people in the images. We welcomed Jessica Johnson, processing archivist, to our staff to assist with our processing backlog and anything else we can think of! A recipe for home-brewed beer found within the collections of the Virginia Historical Society (VHS) inspired Ardent Craft Ales to brew up a batch of persimmon beer. Ardent Craft Ales chose a persimmon beer recipe, “Jane’s Percimon Beer,” from a cookbook kept by Jane (Randolph) Walke (1729–1756), her mother, Jane (Bolling) Randolph (1703–1766), and others. The cookbook contains recipes for food preparation, medicinal remedies and beer, as well as business accounts for household items and clothing. “Dressing Downton: Changing Fashion for Changing Times” will be show in the VHS’s newly created changing exhibition space from October 2015 into January 2016. The exhibition consists of 35 costumes and accessories from the popular PBS MASTERPIECE Classic program. Visitors will be able to explore the lives of Downton’s aristocratic inhabitants and their servants during the World War I period. It was a busy year for Virginia Tech Special Collections in 2014! Among our more than 100 new acquisitions for the year, one of our donations included a handwritten acceptance letter to Virginia Agricultural and Mechanical College from 1873 (that’s the second year our institution was accepting students!). The student who received the letter, George D. Showacre from Greene, Va., attended VAMC from 1873-1875. We processed a variety of collections this year, including the tiny (2 inch x 3.25 inch) diary of Major Enoch Stephens, who guarded the Lincoln assassination co-conspirators and witnessed their execution in 1865. You can see the finding aid here. We also launched our new Omeka site as a way to share digital content with our local, regional, and global community: http://omeka.lib.vt.edu/. While we’re still working on it, there’s already quite a bit to see! We were sad to have one archivist leave us in the spring, but we were lucky to hire two new faculty in the fall. Our new Collections Archivist, Sam Winn, and Processing and Special Projects Archivist, Laurel Rozema, both started in October. Sam will be working with the International Archives of Women in Architecture materials and will also help us branch out into collecting materials related to women and minorities in Virginia. Laurel’s first task will be processing some of our very large collections housed on-site and in off-site storage. This year’s NEA-MARAC meeting in Boston is propitiously scheduled near the end of March. So while cold weather will undoubtedly be lingering, the anticipation of Spring will be in the air. Since Boston is nestled within narrow geographic parameters, this means you may well choose to hoof it to many of your destinations. But since it is also a big city, you have your pick of vehicular transportation as well! · Cost: a single fare can cost up to $2.65. If you are running around a lot during your trip, that can add up fast! For visitors, I usually recommend buying an unlimited Link pass, which are currently $12 for a single day and $19 for a week and cover buses and trains. Alternatively, if you can get your hands on a Charlie Card, you can add money a bit at a time. If you end up with money left over on your pass or card, you can always hand it off to a local colleague or friendly street stranger! · Buying a ticket/pass: On buses and green line trains that are above ground, you can pay in cash. Most below-ground transit stations will have machines for you to buy a ticket or a pass with cash or card. To add money online (or at a machine), you need to have a physical Charlie Card – which you can procure for free from any Customer Service Agent at these stations. · Subway lines: The most geographically relevant lines for the conference will be the Green line and the Red line. 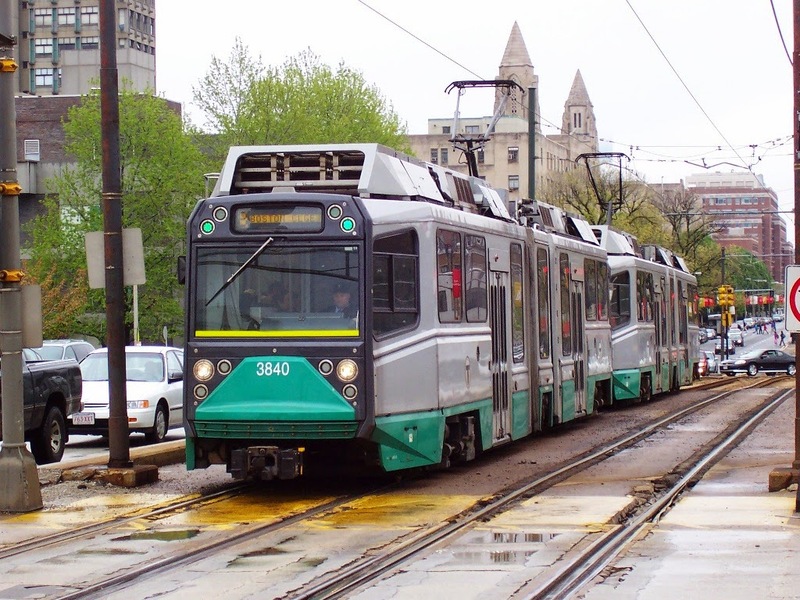 The Green line runs from East to West and covers a lot of the downtown area, Back Bay, the Fenway, &c. The Red line intersects with the Green at Park Station (next to the Boston Commons), and runs North to South, up through Cambridge to Somerville. 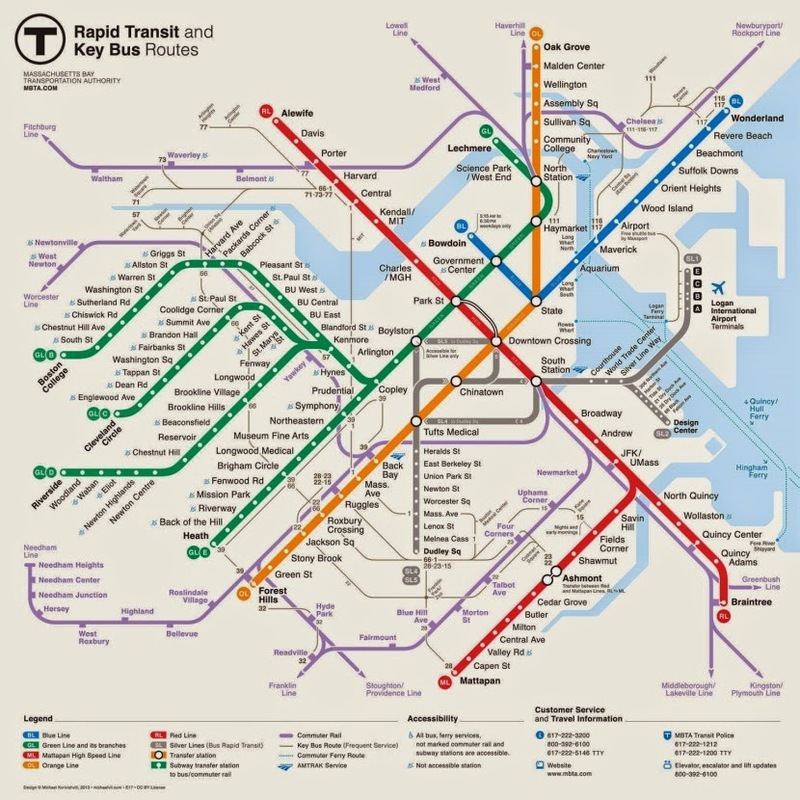 If you’re interested in checking out other areas of the city, you can utilize the Blue and Orange – or even the Silver (which is good to take from the airport to get into Boston) – lines. Schedule: The T runs from 5:30am-ish to midnight-ish on the weekdays. Within the past year, weekend nights were extended to 2am (hallelujah!). Cabs are your best bet outside of these time restrictions. If public transit isn’t your game, taxi cabs are in abundance, as are the recently popular Uber and Lyft options. Before you jump in the back of a cab, be aware that some cab companies are cash only and aren’t equipped with a card reader. As mentioned above, the silver line will get you from the airport into Boston proper easily, while a cab ride from there will probably be about $20-30. If you plan on renting a vehicle during your stay, be prepared for parking and traffic frustrations. Sometimes you can get lucky with a parking place, but on average parking a car near – say Little Italy – will result in spending twenty minutes searching for free parking perhaps only to sigh and pay $14 for a spot instead. All nominations shall be submitted to the Awards Committee by February 28, 2015. Museum Archives holdings are primarily textual documents related to the Metropolitan’s institutional history, collection, and past exhibitions, dating from 1870 through the twentieth century. The intern’s responsibilities will include archival processing of Museum records, reference assistance to Museum staff and non-staff scholars, and historical research. The ideal candidate will be enrolled in a graduate program in library/information science or archives management. In addition to developing practical work skills through this departmental placement, the intern will participate in MuSe (Museum Seminars) and interact directly with the Museum’s diverse audience by conducting a gallery talk based on their area of expertise. The internship commences with MuSe (Museum Seminars), a series of curator talks in the galleries and presentations by executive staff that introduce interns to the curatorial, educational, and operational structure of the Museum. The seminars also include hands-on workshops and practice sessions to prepare interns to lead gallery talks and tours. Graduate interns attend mandatory full-day MuSe sessions for the first week of the program, and then each Monday throughout the rest of the summer. This internship is open to individuals who are currently enrolled in a master’s program or who have graduated from a master’s program within one year of the application deadline. PhD candidates are not eligible to apply, but may be eligible for one of several Museum Fellowships. Application deadline: January 23, 2015, at 4:00 p.m. They were processed as part of an initiative to make accessible by summer 2015 a total of fifteen collections of Museum records, funded by the Leon Levy Foundation. The Archives also completed processing the Robert Lehman papers, which consist of approximately 97 linear feet of material related to the collecting of art by Robert Lehman and his father Phillip. Upon Robert Lehman’s death in 1969, he bequeathed 2,600 artworks to the Metropolitan Museum; these papers document the acquisition and cultivation of this magnificent art collection, and include correspondence with galleries, dealers, advisers and museums, invoices, insurance records, object descriptions and inventories. A comprehensive finding aid to the papers is available here: http://libmma.org/digital_files/archives/Robert_Lehman_papers_b1848688.pdf. Processing of the Robert Lehman Papers was supported by a grant from the Robert Lehman Foundation. We are now about two and a half months away from the MARAC/NEA joint meeting in Boston. The conference will be held March 19-21, 2015 at the Boston Park Plazahotel. Registration opens January 8. Information is being posted on both the MARAC and NEAsites. The program and local arrangements committees are in the midst of putting together a great event. 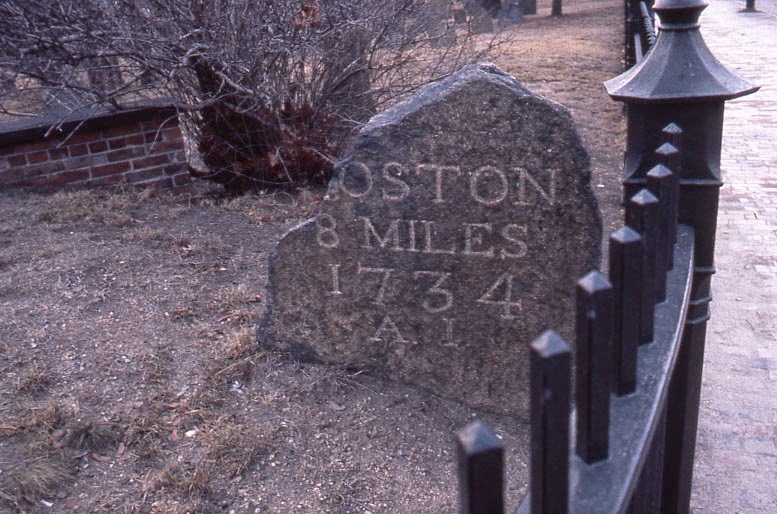 We will be using this blog to share information about getting to, and around, Boston; where to eat and drink; great places to visit; and of course, the ins and outs of the conference itself. For those of you who are ready to start planning your trip, Google Docs for sharing rides and sharing rooms have been created (Thank you Rebecca G. for the template!). Please check back often for updates. The posts will become more frequent as we approach the event. If there are specific topics you would like to hear about, or if you are interested in writing, please contact Blog Coordinator Jennifer Sharp. We’ll be there before you know it! The Mid-Atlantic Regional Archives Conference (MARAC) was born from a desire to support local archivists with opportunities for professional development, education, and collaboration. As a volunteer organization, MARAC depends on the sustained dedication and efforts of our members to provide these valuable services. MARAC values and honors those who have committed their time and expertise to developing and promoting our wonderful programs. The Distinguished Service Award (DSA) recognizes accomplished members who have made significant contributions to MARAC’s success and to the broader archival profession. The DSA Committee is currently seeking nominees for this annual award. Recognition will be accompanied by a $250 honorarium, provided through the generosity of Hollinger Metal Edge, Inc. Nominations can be made by any MARAC member using the Distinguished Service Award Nomination form,available on the MARAC website. The form should be returned to Committee Chair Ed Galloway [edwardg@pitt.edu] no later than January 26, 2015. Any member wishing to make a nomination is strongly encouraged to provide additional letters of support for the nomination, which may be sent with the nomination form or under separate cover to the committee chair. On behalf of MARAC, the DSA Committee thanks you for your participation. Reward exceptional service and nominate a deserving colleague today!